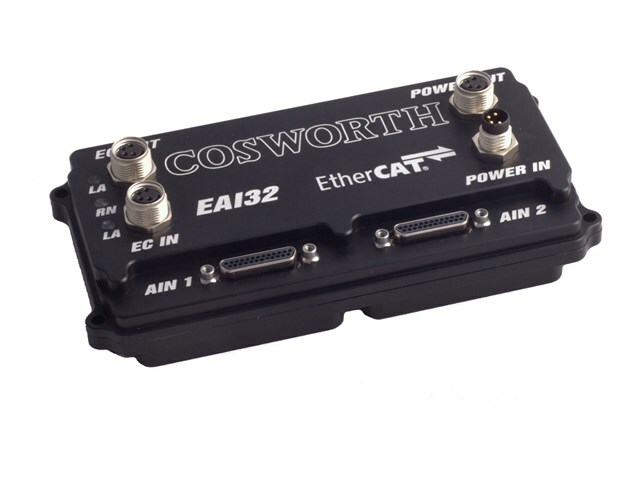 Cosworth’s EAI32 module offers up to 32 high precision, high speed +/-10V analogue inputs in a stand-alone and rugged IP67 aluminium housing. Input resolution is 16bits, with outstanding accuracy and repeatability. Sampling rates go up to 2kHz. The interface to data acquisition systems, including Cosworth’s Pi Diablo, is via EtherCAT®. This is an open and widely used industrial standard offering high speed and sub-microsecond time synchronisation. Input connectors are pin-compatible with Mistral IJB Type A analogue inputs. Both the power and EtherCAT® connections use industry standard M8 connectors. Individual inputs can be software configured as either single ended (up to 32) or true differential (up to 16). Each of the two input connector also offers 4 0-10V programmable excitation lines, 2 of which can be software configured as switchable outputs.